Looking back at the accomplishments of 2015 we see that St. Francis is an amazing community of learners dedicated to exploring and developing our God-given potential. When we review a long list of our accomplishments we can see that it is our fantastic parents, driven by common goals, working in tandem with our teachers that create our high level of success. We welcomed our new members with their energy and creative ideas to our community. During Catholic Schools Week 2015 we shared our successes in Science and the Arts with a cup of cocoa and local legend, Bob Shaw. Our annual science fair sent winners to the state competition, Intel’s N.W. Science EXPO. Our families contributed $2000 dollars to help the homeless through Bethlehem Inn and celebrated with our parish family at Family Fun Night. We continue to be grateful to our Knights of Columbus for their participation and support of this annual event. Joy, “Jesus and Others before You”, was our major theme for the 2014/15 school year. We expressed that repeatedly in community and our Wolfpack Fridays. We sent care packages to the troops, middle school collectes 262 articles of clothing for middle school kids in need. We donated needed items to Vital Provisions as a lenten almsgiving project. The school garden donated pounds of fruits and vegetables to the St. Vincent DePaul food pantry. We gathered over 500 items to donate to the parish Christmas Food Baskets. We visited the elderly and sent cards to the sick. Speaking of JOY, we got our joy on with singing, praising, performing and dancing. 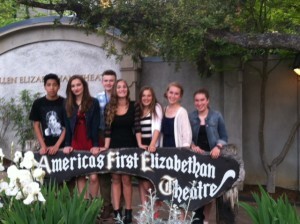 All of our students present their work, perform skits or readers theater in class but we had some big events as well. Our annual Living Station of the Cross, directed by Mrs. Laubacher, expanded to included an evening performance for the parish. A new school song was written and performed for the spring musical and Christmas program, the children’s choir sang at Masses, middle school held three dances just for 6th-8th graders and the Father/Daughter Dance was a rockin’ success. Glitter, Glamour and Gatsby was the theme for our 2015 school auction. With valet parking, games, silent tables and entertaining auctioneers, the April 18th event at the Riverhouse was amazing and we met our fundraising goal. 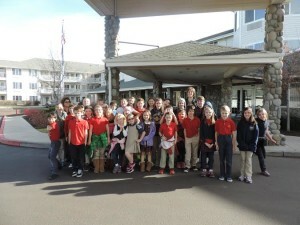 Our Middle School had a tremendous year 6th and 7th grades attended OMSI outdoor school overnighters and the 8th grade attended the Shakespearian Festival. Our Cross Country Team and Track and Field Teams performed very well at District Meets with the 7th grade girls earning first place. At the end of the year, Mrs. Logan took our first traveling school for a week in Washington D.C. This year will take those who choose to attend, to Rome. 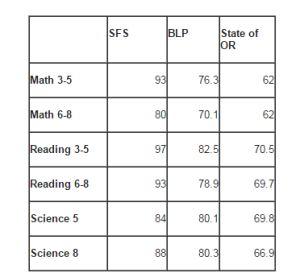 Our 2013/14 test scores, published during the 2014/15 school year, revealed that we far exceeded state scores and even topped Bend-La Pine scores. 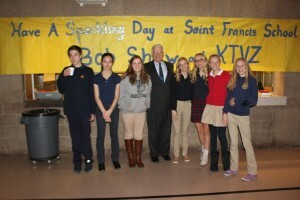 St. Francis is a top local school. This comes as no surprise to us because we see the creativity, talent, and perseverance of our students every day. We see it in events like having 22 winners in the Bend Research Inventorprise contest. We see it in students staying after school to learn chess, math, and to program robots. Our robotics teams both came home with awards this year. 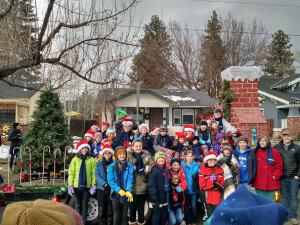 We participate in the Bend Christmas Parade each year as a celebration of community and as a voice of faith during this important season. We won the 1st place Sweepstakes Prize for our float this year. The children preschool-8th grade rode on or walked alongside the flatbed truck while parents walked behind. We enjoyed caroling and shouting “Merry Christmas!” to the crowd. With help from Google and a supportive school family the 5th grade received a class set of chromebooks allowing us to be 1 to 1 with chromebook from 3rd-8th grades. Pre-K to 2nd grade are sharing 18 Ipads with the hope of being 1 to 1 in the coming year. Of course, Ipads have such unique capabilities that we share them as desired throughout the building. Unity is in our community. St. Thomas and St. Francis are linked by Mrs. Mooney being the principal of both schools. She has been instrumental in securing St. Francis as an Oregon Natural Resources Education Program school along with St. Thomas. The staffs are enjoying having teachers at their grade level to share ideas with. Collaboration is always preferable to isolation. Along that line we are finding new unity between the parish and the school as we work together to achieve common goals. Father Julian has led the way with a gentle appeal creating a new scholarship and three openings in our student body. The positive atmosphere in and around our school is the greatest blessings of 2015.